For this month's baking club, we decided to make Christmas treats! It seems that fudge is made just during the holidays and not during other times of the year. I, for one, always look forward to enjoying my grandma's deliciously addicting chocolate fudge at Christmas! Maybe fudge is so irresistible since we only enjoy it once a year! 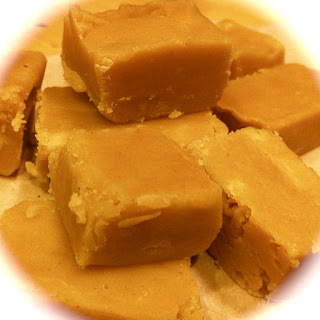 So, would you believe me if I told you that you could make peanut butter fudge with only four ingredients after four minutes in the microwave? Well, check your pantry for the four magic ingredients, and get ready to believe it! This fudge takes just a few minutes to prepare, and clean-up is a snap. After the microwaving, it may take a little muscle to stir the fudge together (*cough, cough* consider it a bonus mini workout? ), but it takes even more willpower to resist sampling the fudge until it is chilled. Your patience will be rewarded! This creamy fudge tastes like the inside of a chocolate peanut butter cup. It has a soft, creamy texture with a mellow, perfectly sweet peanut butter flavor. You could even try variations by replacing the peanut butter with Nutella or Biscoff Spread/Cookie Butter. This recipe is easy to make and easier to eat. It has gained a spot on my yearly Christmas "must make" list. 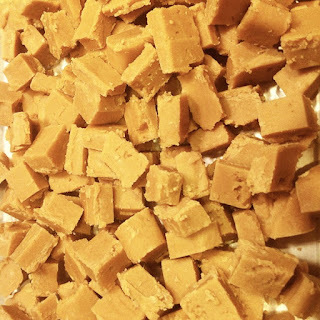 Add a "side of Nirvana" to your holiday dessert platter with this peanut butter fudge! Make sure to check out the creative treats of my fellow bloggers over at the Deep Dish, the Orgasmic Chef, From My Sweet Heart, and the Squishy Monster! Happy baking, and keep enjoying the sweetness of the season! Line a 8 x 8" baking pan with parchment paper. Spray the parchment paper with cooking spray, or grease with butter. In a medium-sized mixing bowl, add the peanut butter and butter. Cover with plastic wrap, and microwave on high for 2 minutes. After two minutes, carefully remove the bowl from the microwave and stir. Re-cover with plastic wrap, and microwave on high for 2 more minutes. Carefully removing the bowl from the microwave, and stir well to ensure all the melted butter is combined with the peanut butter. Add the vanilla extract, and then stir in the confectioners' sugar using a wooden spoon. The mixture will become difficult to stir and will lose its sheen. Spread into the greased 8 x 8" baking pan. Place another sheet of parchment paper on top of the fudge. Refrigerate until cool, for at least 2 hours. Cut into 1 inch pieces and store in an airtight container at room temperature for up to one week. Alternatively, you can freeze fudge. Wrap in parchment and foil, and place in a freezer safe bag. Thaw at room temperature before serving. How easy peasy and PERFECT for the holidays!! !